I rag on England quite a bit, it’s true. It’s cliche to criticize their food and weather. In truth, the weather is no worse than the US Pacific Northwest. In fact, during my first year living in England there was a great heat wave that killed hundreds in continental Europe, but made the British Isles warm and sunny. The food is deplorably greasy and tasteless. But I found that a combination of Indian food (it’s everywhere like Mexican food in the US), potlucks with fellow international students, and Sunday roasts and English breakfasts at good pubs, made it bearable. The food and weather? No problem. What really annoyed me about England was the laughably crappy service, the unyieldingly arrogant bureaucracy, shabby infrastructure, widespread drunken violence, shockingly unreliable public transportation, and an annoying display of rampant outdated self-importance. Not to mention the inflated pound sterling that made all this twice as expensive as North America. Let’s also add the archaic and rigid class system. Great architecture. I don’t know how so much of it survived the Nazi firebombings of World War II, but I’m sure glad it did. Lots of nature. The austere moors, the picturesque farmland, verdant hills. Amazing that in a country of 50 million people crammed into an island smaller than Oregon, that there is so much greenery. Cute villages, beautiful cities. Cambridge, York, Saltaire, Hebden Bridge, and of course London, are some of my favorite cities and towns. Big pints of tasty mellow beers filled way up to the tippy top. Incomprehensible regional accents. I love listening to the varieties of English. And most important of all: fabulous museums that do not charge admission. This is Tony Blair’s greatest legacy, public museums accessible to everyone. The British Museum. It’s imperial plunder at its finest. Just about every country in the world wants something back from this glorious collection of loot. The Greeks want the Elgin Marbles back. Egypt would love to have back the Rosetta Stone and the Cleopatra mummy. And Nigeria has been lobbying for a return of its Benin statuary. It’s an amazing collection. 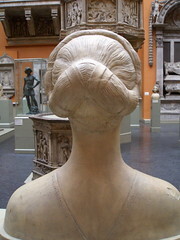 The Victoria and Albert Museum. Most of the pictures from my London flickr set are from the V&A. If you love design this is the place to go. Complete collections of medieval instruments? It’s here. Art deco glass? Victorian ceramics? Watches? Swords? There aren’t many better collections. While you’re in the neighborhood, don’t miss the Albert Memorial in the nearby Kensington Gardens. It’s delightfully gauche and over the top. I have a few pictures in the London flickr set. National Portrait Gallery. Lots and lots of portraits of royalty and celebrities, done in a wide range of media, including photography. I like looking at all the faces from different eras and in different artistic styles. The Tate Modern. This is where you come for your modern art fix. Even if you don’t like a lot of contemporary stuff, it’s a great atmosphere to be in. The museum itself is remodeled from a massive power station. After perusing Warhol and Lichtenstein, go to the cafe on the top floor, order a beer or a latte, pick up a free Guardian newspaper, and gaze out over the Thames River and the Millennium Bridge. This is my favorite spot in London. From here all my gripes about England just float downstream. As an ex Brit I agree with everything you say. The history is fantastic. I still enjoy returning to England to ‘make like a tourist’.